As Dr. Gonzo, Halloween 2003. The great Hunter S. Thompson died ten years ago. At the time, I was just out of college. My buddy Clint Hendler ran the Dartmouth Free Press, the now-defunct liberal campus rag where I posted my rambles during college, and he let me submit this tribute piece. It’s heavy on Dartmouth references and sweeping generalizations, but cut me slack, I was 22 years old in the midst of the George W. era, and throwing back wicked concoctions of idealism and doom. When Richard Nixon died eleven years ago, Hunter S. Thompson forwent sympathy and announced that Nixon’s carcass was rotting in hell, and that his body should be buried in a trash bin. The world was briefly shocked when the great rebel journalist blew his brains out in behind the walls of his fortress in Aspen; but then again, he was not known for his subtlety. Born in Louisville, Kentucky, the city of Muhammad Ali and DFP Editor Clint Hendler, the good doctor had his share of adventures as a struggling, young journalist. His first novel, “The Rum Diary,” depicted life as a 22-year old writer on the perpetual brink of disaster in Puerto Rico. His real break came when assigned to write a story covering the increasingly notorious Hell’s Angels. Determined to get a fresh scoop, he offered the biker gang a keg of beer in return for the opportunity to ride with them for two months. His ensuing novel, “Hell’s Angels,” brought him acclaim, and he joined a fledgling new magazine (Rolling Stone) to become their national affairs correspondent. In’71, he set out to write the seminal novel about “the death of the American dream.” The product of an incomparable drug bender, “Fear and Loathing in Las Vegas” became the anthem for a generation that crashed hard after the collapse of the 60s. He followed with “Fear and Loathing on the Campaign Trail ’72,” which is one of the most indispensable books ever written about a political campaign. His best collections include “The Great Shark Hunt” (covering most of the’70s) and “Generation of Swine” (a tirade against the Reagan administration). Perhaps his greatest article, “The Kentucky Derby is Decadent and Depraved” paints a picture of the southern aristocracy as seen through the eyes of a drunken maniac spraying people with mace. I imagine it’s the same feeling one gets when crashing through the unwelcome orange gates of KDE’s Kentucky Derby party year after year. His life was one big weekend, and he was able to write about it while making enough money to get by. 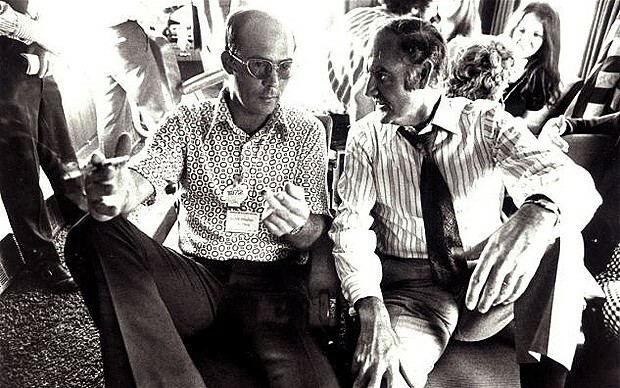 Fear and Loathing on the Campaign Trail, with George McGovern. The Freak Power ticket was the model of my two runs for Student Body President, especially the “It’s Hard to Stop a Moving Train” posters. Because as Thompson taught, politics doesn’t have to be boring. Darwin’s twisted course, unfortunately, has produced an industry of the self-righteous, the self-loving, the idealists who enter the game seeking great change without a clue about how the game works, and the people who have been playing so long they’ve lost track of why they’re there. As with many cultural warriors from his generation, I think that Clinton’s betrayal of the left followed by their complete immolation at the hands of the Christian right damn near crippled him. He had his realization that what was once pure and good was forever going to be seen as evil, and his “change is gonna come” spirit faded out. Or maybe it was just the drugs catching up to him. It’ll happen to Keith Richards one day too, I imagine. Emulating Hunter S. Thompson is always a good time, and I vividly (well…) remember one Halloween where my roommate and I robo-tripped around campus, dressing the part, carrying a briefcase full of goodies and a big tape recorder to capture the inanities of Theta Delt basement conversation. But despite the steady madness of Hanover, you can’t really do the fear and loathing thing until you run train on Vegas, and my ticket came one fateful night last August. I was lounging in my trailer in Aberdeen, South Dakota, where I was working on an uninspiring Congressional campaign. My phone rang—it was the field director for ACT Nevada. How did I feel about leaving Aberdeen (pop. 22,000) for double the salary to work in Las Vegas? I gave said old roommate a call, and a week later we were prowling the streets of dirty old downtown Vegas, escaping a gunfight, gambling for our next drink, and experiencing the healthy dose of insanity that comes with having a stripper and a gay lion tamer as our roommates. The 24 hours following Hunter Thompson’s death were tough. A deluge of calls and emails, even instant messages, of despair—despair tempered by the fact we all knew this day would come. Some went out and dummied themselves on hard liquor and opium, stumbling the streets high and wasted in homage to the greatest of modern day ragers. “Death before dishonor and drugs before lunch” was his motto, a work hard-play hard mentality that fits right in at Dartmouth. But Hunter S. was not a mere caricature—there was sentimentality to him too, and he wouldn’t be above reflecting. After all, at his core he was a journalist and a reporter, and he reported on what he saw, most of which was doomed. He went headlong, pell-mell into life, trying to experience it in a way that most are far too timid to do. Take away the drugs, alcohol, and guns, and his life was still compelling, a celebration of freedom, and all the crazies who inhabit this lonely nation. But at the end of the day, it is time to set his devout legions loose to keep fighting the good fight. Remember the man by his last request—he wanted his ashes fired out of a cannon. Yes, it is painful to realize he is gone, but if you can’t alter your mind with crazed substances to numb the hurt, at least you can alter your place and time. I think of the time a hammered Tubestock reveler belted the national anthem while the drenched ole’ glory flapped in the air. I think of the time Young Dems president Paul Heintz and I were chased out of Montreal by pepper-spraying prostitutes. I think of the great Johnny Powell, and the havoc he wreaked on our campus that fateful fall. I think of the time a group of friends crashed Dartmouth Review tails while tripping on mushrooms. The culture war isn’t over yet, not while there are snipers in the bushes. No it’s not over by a long shot, at least not for this weary traveler of the proud highway. Because when the going gets weird, the weird turn pro. And it never got weird enough for me. And it never got weird enough for me. This was beautiful and hilarious. Made my day. Sent by fairies who live in my purse. Kindly excuse brevity and typos.